Our CTO Is a Dean’s List Finalist! 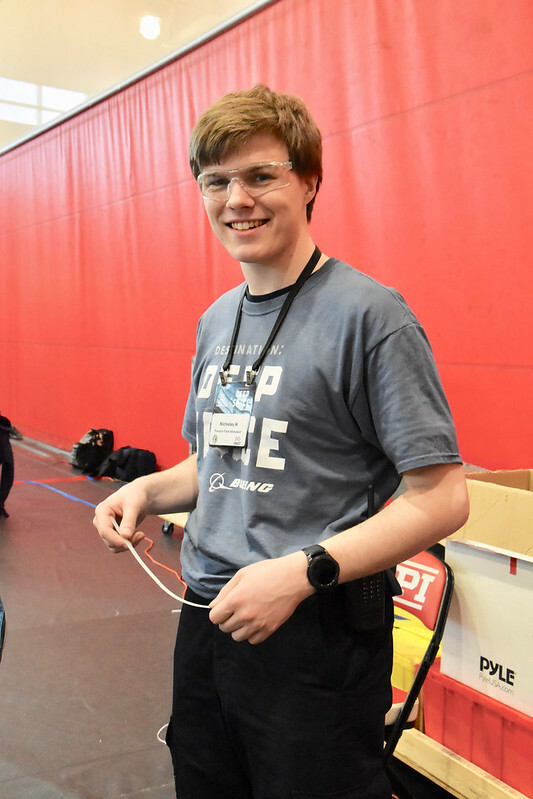 The LigerBots competed at the New England District Championship at Worcester Polytechnic Institute this weekend, and our CTO is a Dean’s List Finalist! We finished the season with an offensive power ranking of 29 out of more than 200 teams in New England. Samy with the other Dean’s List finalists at the New England District Championship. 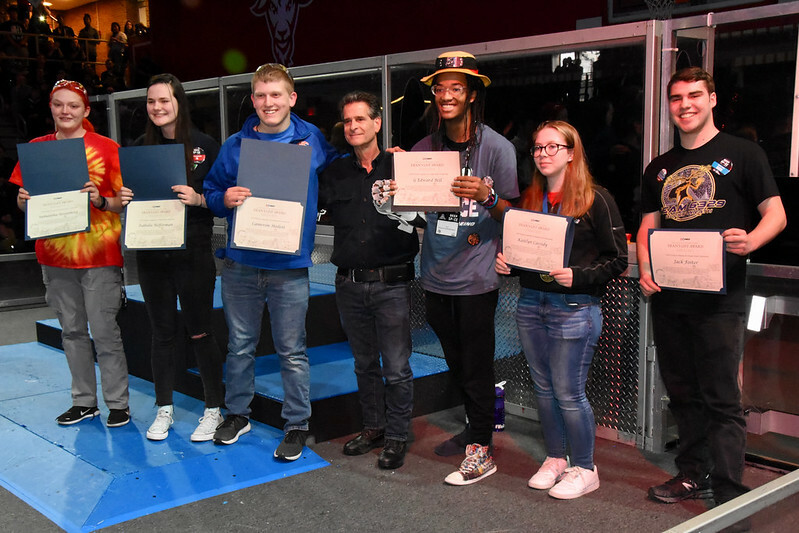 FIRST founder Dean Kamen, for whom the award is named, is fourth from left. 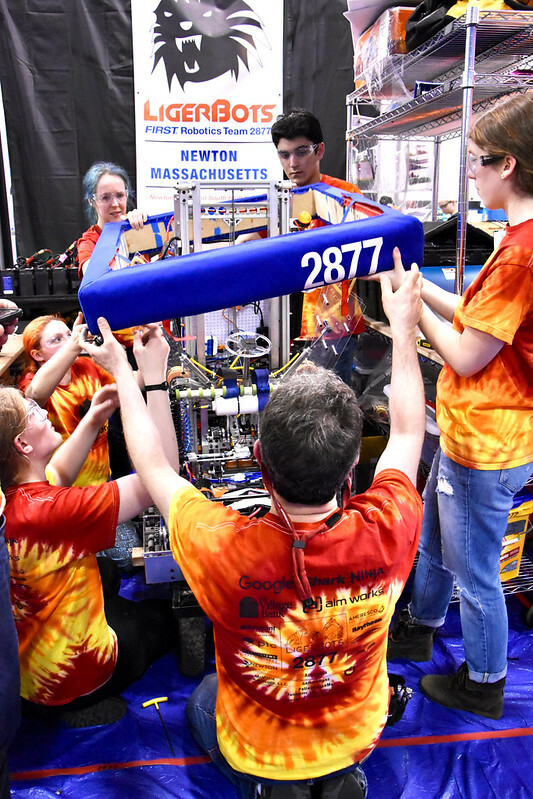 Samy, the team’s chief technical officer and a junior at Newton South High School, won a Dean’s List Finalist Award, given to student leaders who have led their teams and communities to increased awareness for the FIRST Robotics program and its mission to inspire students to pursue studies in science, technology, engineering and math, all while achieving technical expertise and accomplishment. She will compete for the Dean’s List Award at the FIRST World Championship in Detroit during the weekend of April 24-27. 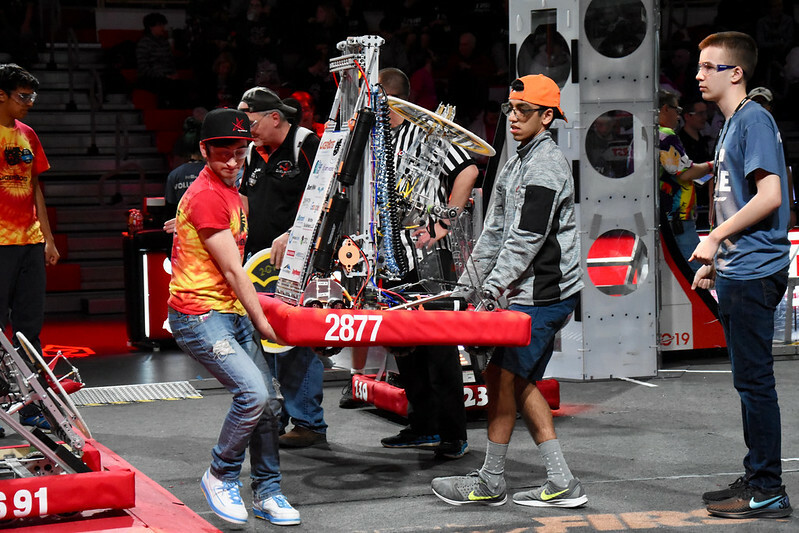 Mark and an alliance team member place Thanos onto the field. 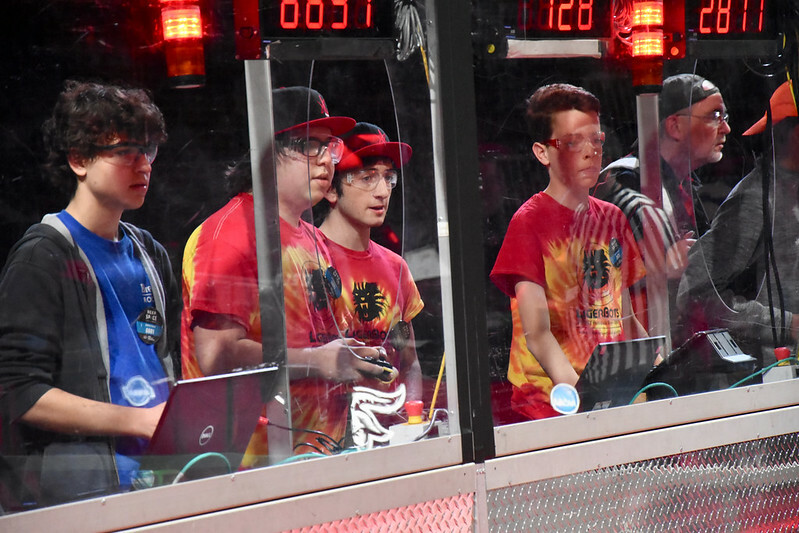 The LigerBots drive team plays a match. 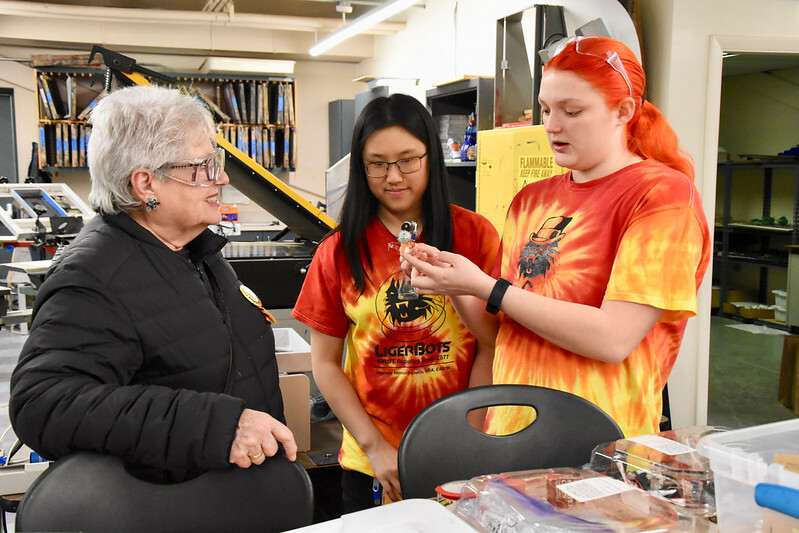 LigerBots alumni and current WPI students Nick Hollander and Kayla Swiston volunteered as practice field monitors and competition field resetters at the event. LigerBots alum Nick Hollander at the practice field. 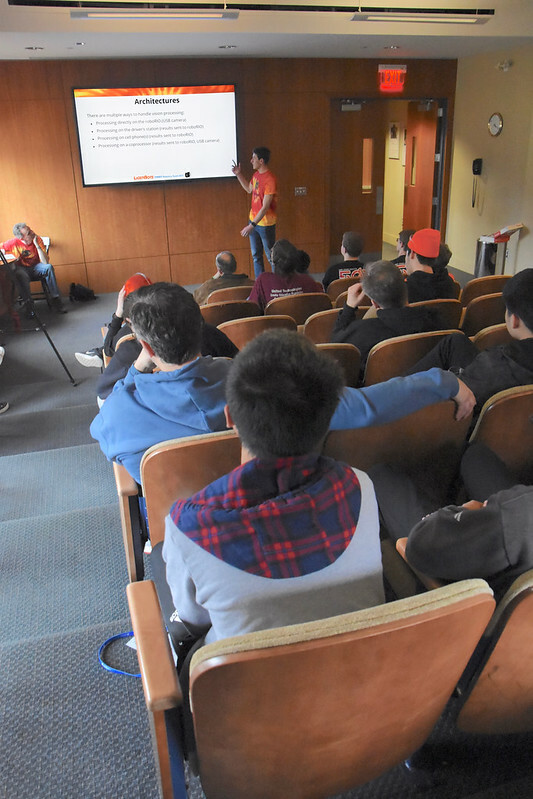 LigerBots programmer David and software mentor Paul Rensing gave a 30-minute seminar on robot vision to about 40 FRC team members during the newly introduced NE District Championship lecture series. If you would like to read the white paper that was the basis for his talk, you can find it on our website, here. David presents his talk on robot vision. 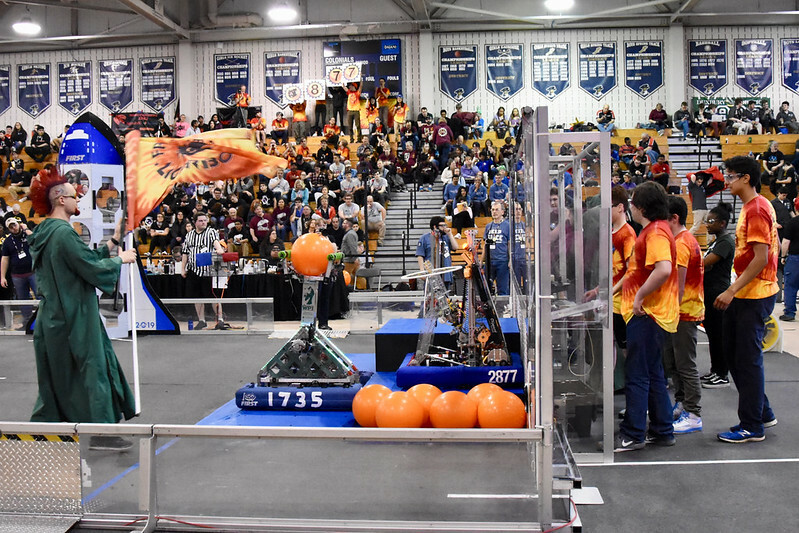 Last weekend the LigerBots competed at Shrewsbury Regional High School with and against 38 other New England FRC teams, in our second district qualifier, the Central Massachusetts District Event, which was hosted by team 467, the Colonials. We made it to the quarter finals with our robot, Thanos, and won the FIRST Entrepreneurship Award. LigerBots co-head coach Noa Rensing was advanced to the next stage of the Woodie Flowers Award process. 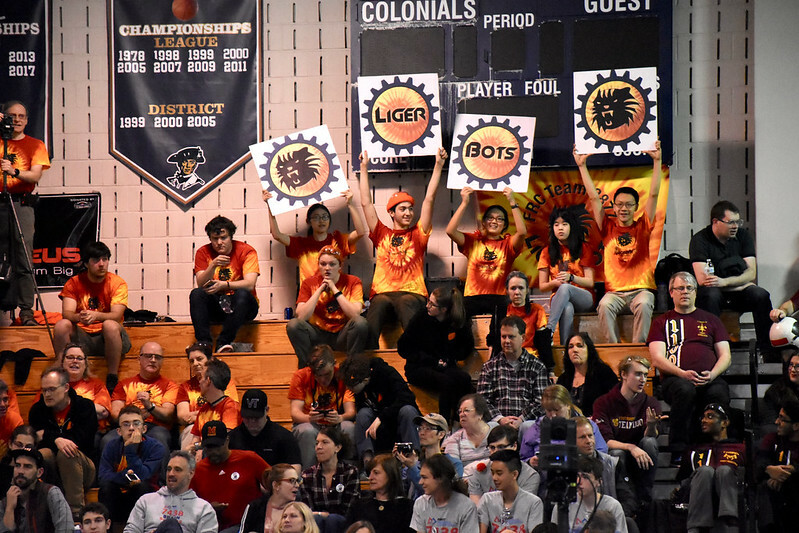 LigerBots cheer for our team during the Shrewsbury event. We were predicted to do very well with our robot, Thanos. The NEforecast 2019 on FIRST discussion forum Chief Delphi said, “If you leave the LigerBots undefended, you’ll be sorry, because you’ll be hard-pressed to match their scoring output.” And, despite some bad luck and being eliminated in the quarter finals along with the rest of the fifth alliance, (teams 1735, Green Reapers, and 2262, Robo-Panthers,) our intense pre-competition training paid off. 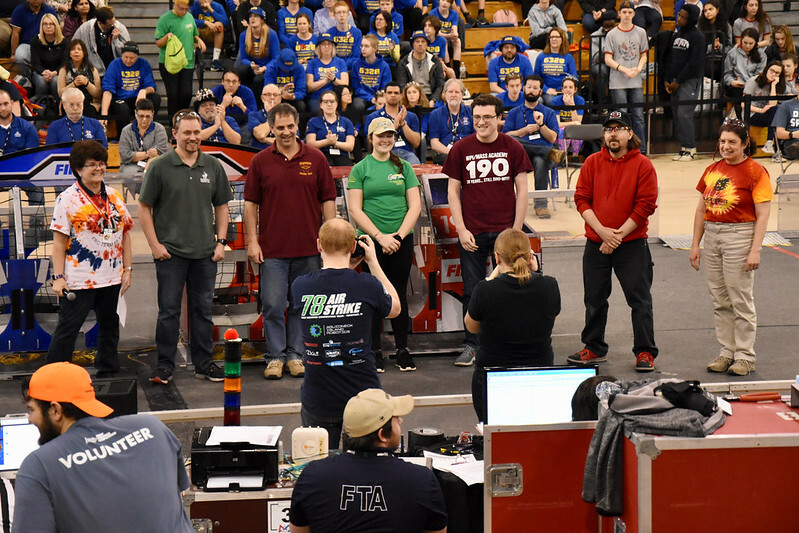 FIRST emcee “Angry Eric” Eckhardt waves the LigerBots flag to introduce the team to the crowd before a match, as our drive team watches. LigerBots CTO Samy and Angry Eric compare hairdos. We were fast in moving around the field and super efficient in placing game pieces into their field element goals. Thanos scored the event’s fifth highest total number of Cargo game pieces, and the third highest number of Hatch Panels. 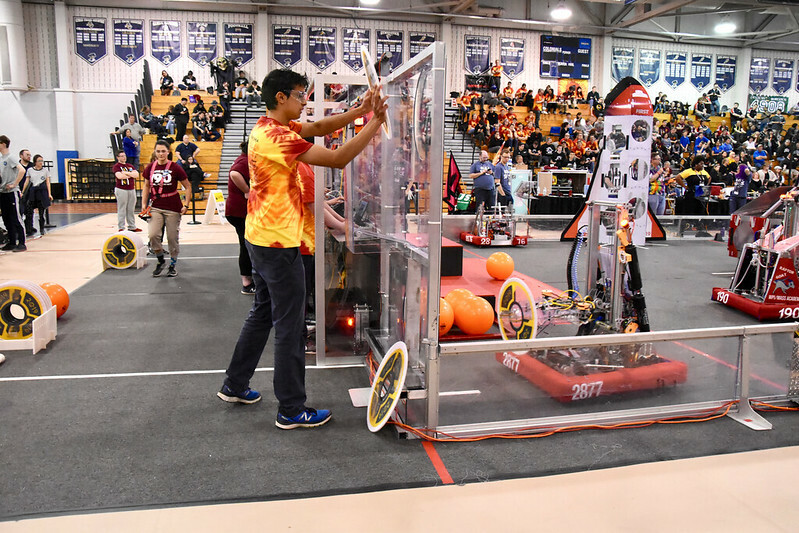 We emerged from Shrewsbury ranked fifth in offensive power rating (OPR), which represents the average point contribution of a team to an alliance. Vivek loads a Hatch Panel into the loading station so that Thanos can pick it up on its next round trip. Thanos places a Cargo ball into the highest Port on the Rocket Ship. Our drive team can be seen at the far right. LigerBots reattach Thanos’ bumpers after making a repair in our pit. We recorded the performance of other robots during the competition in cooperation with scouting alliance partners team 157 Aztechs and team 3205 Patriots. We continued the training of our strategy council rookies even during the competition, by having them each shadow a strategy veteran during meetings with the drive team. Amanda scouts a match from the viewing stand. 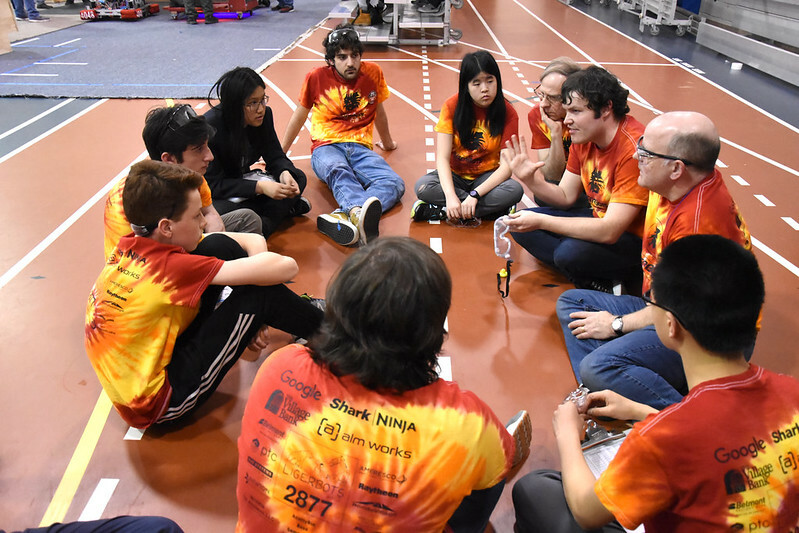 The drive team and strategy council meet between matches, including strategy rookie Charlotte. 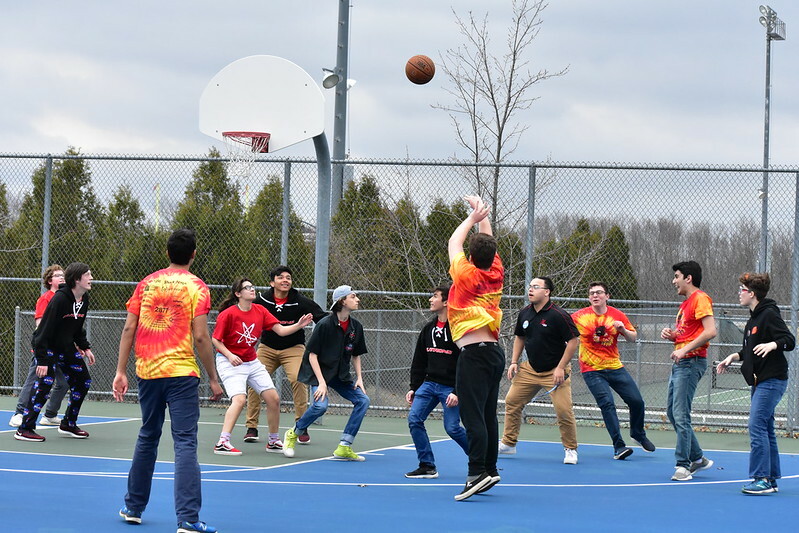 LigerBots play basketball on the Shrewsbury Regional High School outdoor court with members of other FRC teams during lunch break. 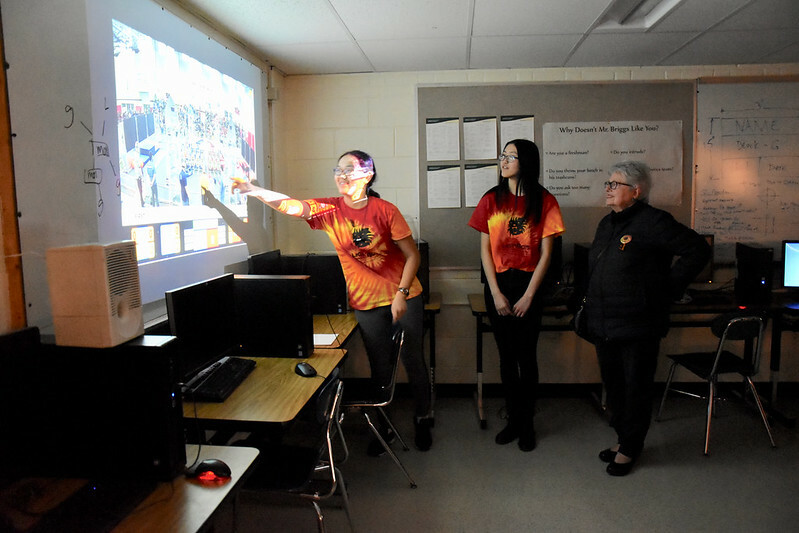 Our constant practice in speaking about the LigerBots helped team members give complete and accurate answers to questions about the team’s accomplishments and goals as judges made the rounds of the pits. Our Chairman’s Award group gave a newly polished presentation to the Chairman’s Award judges. 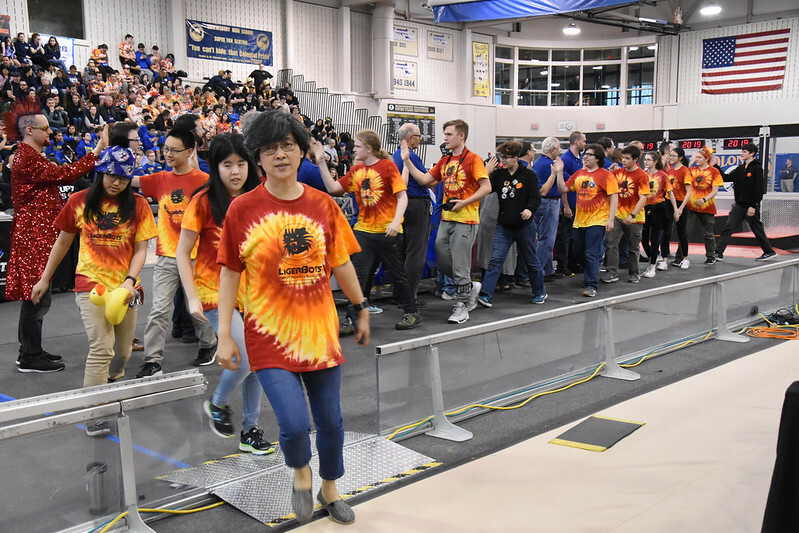 After the robot game finals, the team made two appearances on the field to collect awards. The LigerBots won the FIRST Entrepreneurship Award, which is given to the team that has developed the best comprehensive business plan. 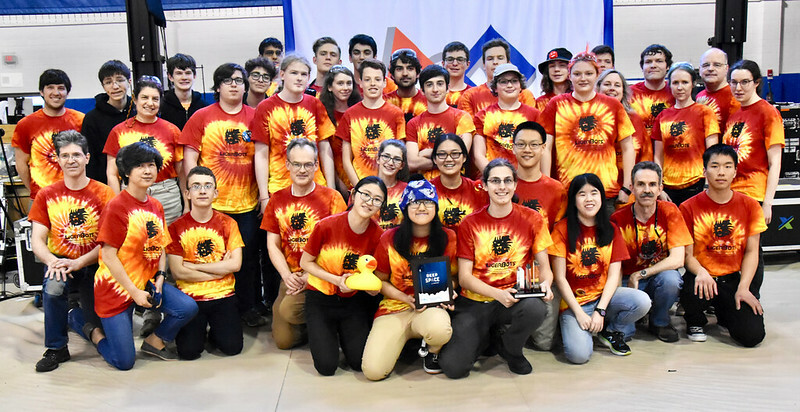 We will compete again for this award at the New England District Championship, at WPI, if we qualify with our robot for that event. Co-head coach Noa Rensing advanced to the next stage of the Woodie Flowers Award process. This award recognizes an outstanding mentor who inspires and challenges students. 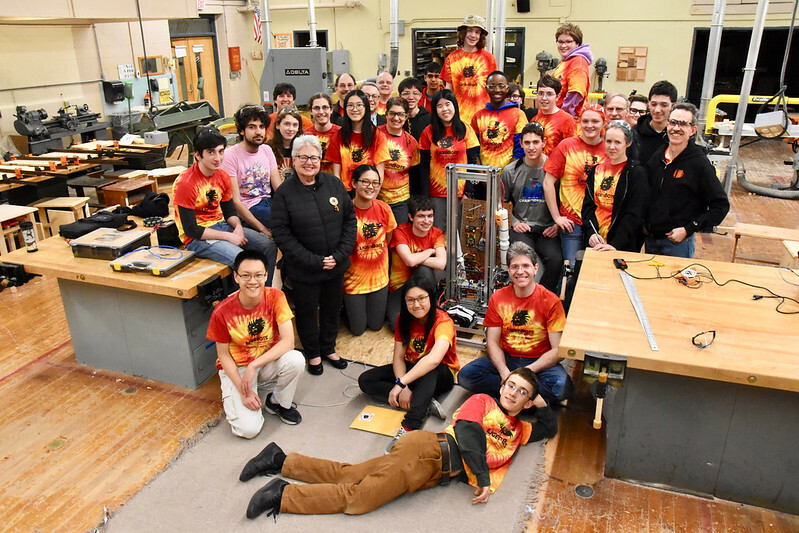 If she advances again at the New England FRC District Championship, April 10-13, she will become a finalist for the Championship Woodie Flowers Award, which is given in Detroit at the FIRST World Championship, April 24-27. The LigerBots receive the Entrepreneurship Award from the judges. Team COO Jordan and marketing mentor Greer Swiston show off the trophy and plaque received by the LigerBots for winning the Entrepreneurship Award at Shrewsbury. Co-head coach Noa Rensing is recognized, along with mentors from other teams advancing in the competition for the Woodie Flowers Award. Now we are back in the shop, working on a mechanism to allow Thanos to climb onto the second level of the “Hab” platform for extra points at the end of the robot game. We are also working on improving the software for our autonomous mode. 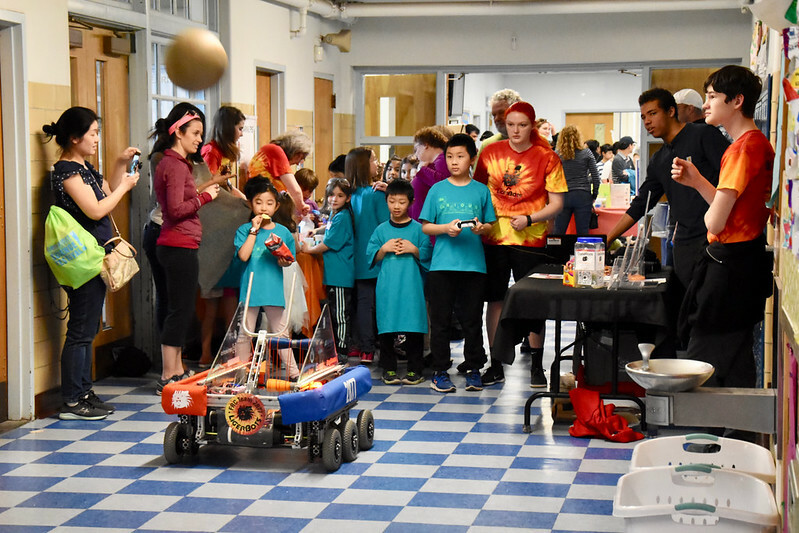 The LigerBots at the Central Massachusetts District Event, in Shrewsbury. 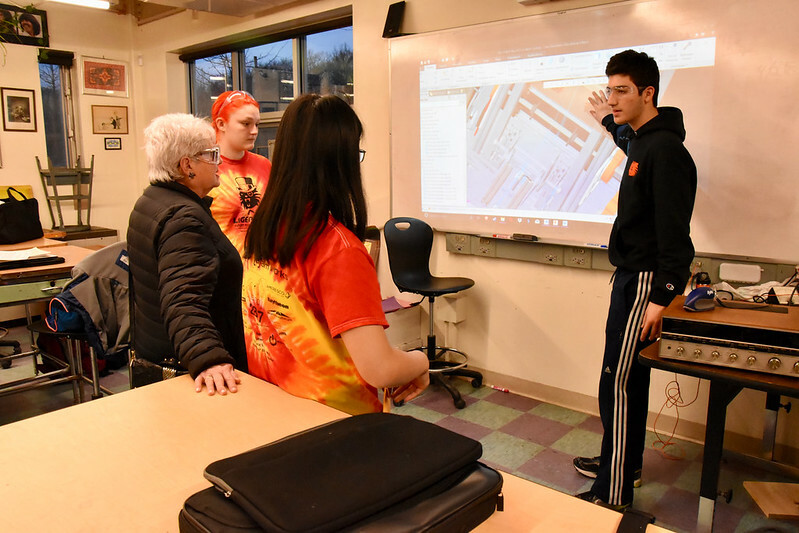 We will learn if we will qualify for the New England FRC District Championship after the last district qualifying competitions, the weekend of April 6 and 7. Even if our robot does not go to the District Championship, (which we hope it will!) 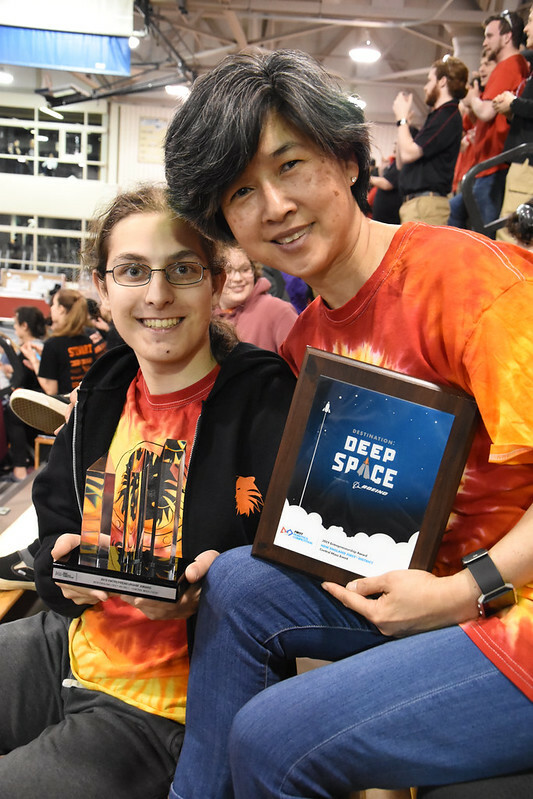 CTO Samy and co-head coach Noa Rensing will compete for the Dean’s list and Woodie Flowers awards, respectively, and the entire team will attend the event as volunteers. For more photos of the Shrewsbury tournament, visit our Flickr album for this event. 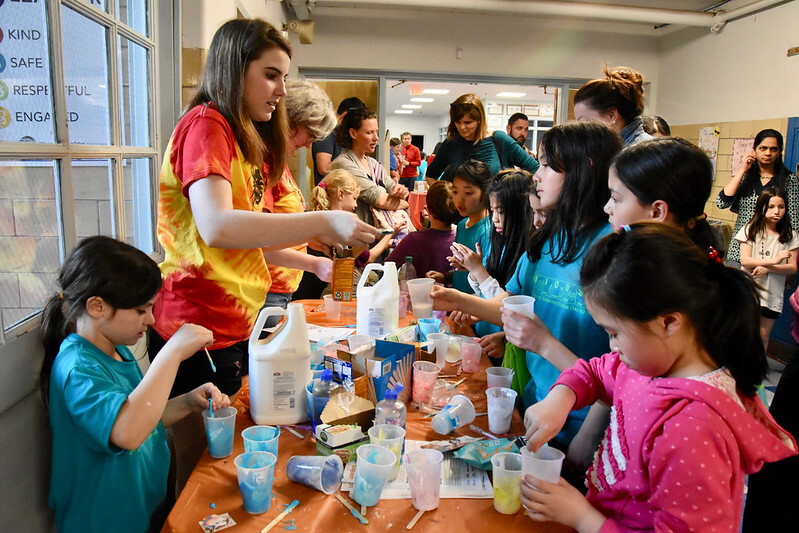 In mid-March two LigerBots attended “Steminist Saturday” in Boston. 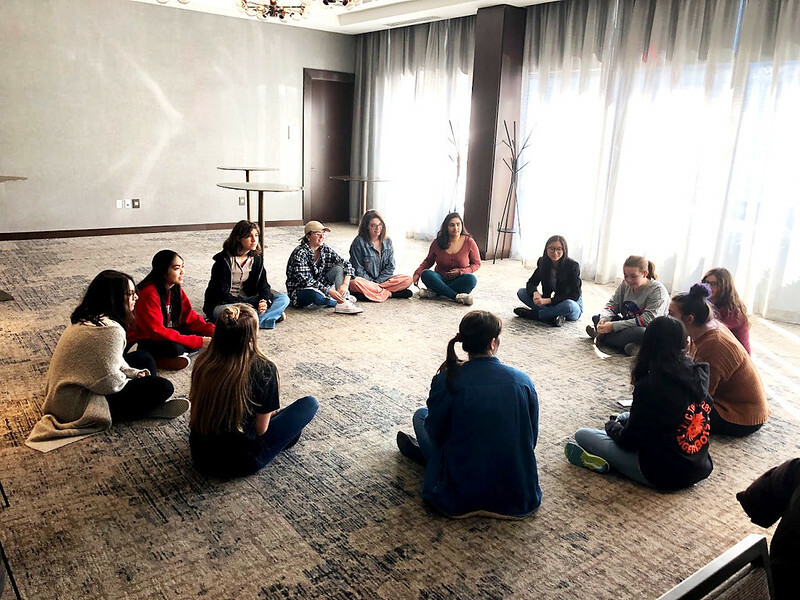 This event was run by the Boston contingent of the nonprofit feminist organization Girl Up. 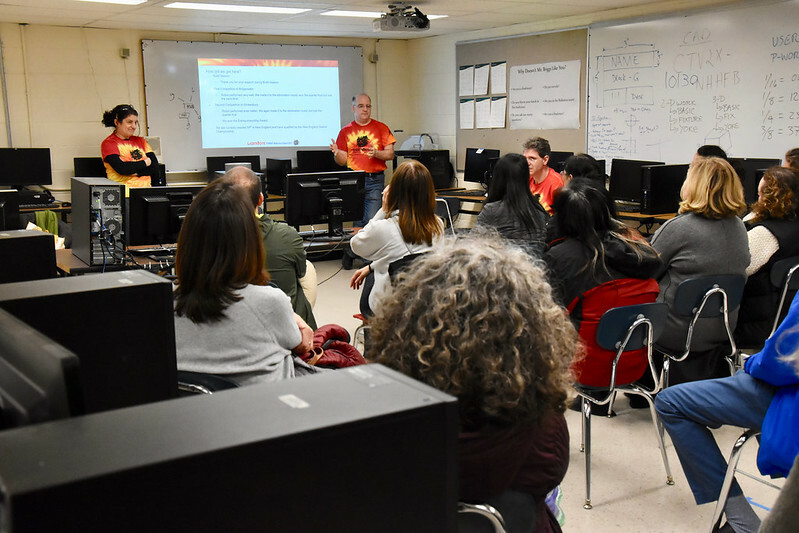 The LigerBots and other attendees (including members of Connecticut FRC team 3654, Tech Tigers) received advice from a woman with a career in technology, participated in a music and medical workshop, and shared their experiences of being women in STEM. Our second of two district competitions, the NE District Central MA Event, will take place March 30 & 31 at Shrewsbury High School. 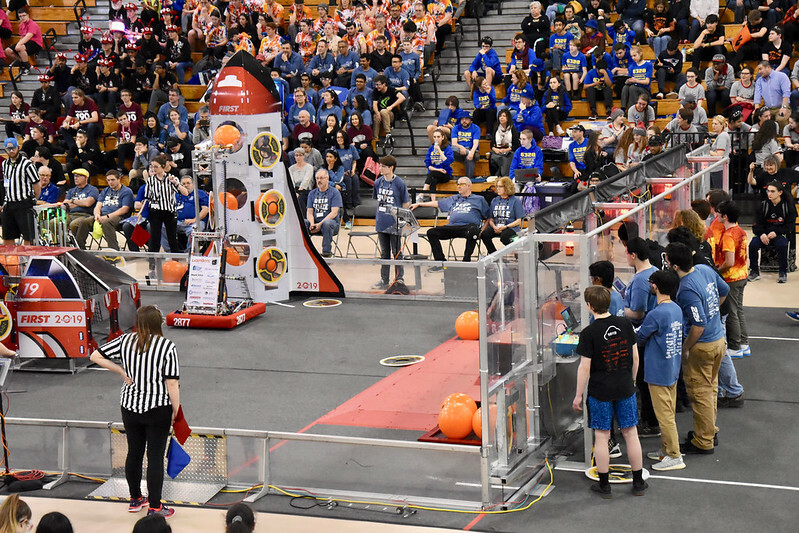 The event will be live streamed via Twitch TV or the Blue Alliance site. Here is a link to the Blue Alliance page listing the teams that will be participating. Typically the competition viewing is 9am – 5:30pm with a break for lunch. Exact times can shift if the event runs behind. The event is free to watch so come join us! You can also watch via livestream at this link.